A team of researchers from MIT, the Max-Born-Institut, Technische Universität Berlin and Deutsches Elektronen-Synchrotron (DESY) has found that using ferrimagnets instead of ferromagnets could theoretically speed up spintronics devices. In their paper published in the journal Nature Nanotechnology, the group describes their research and what they found. 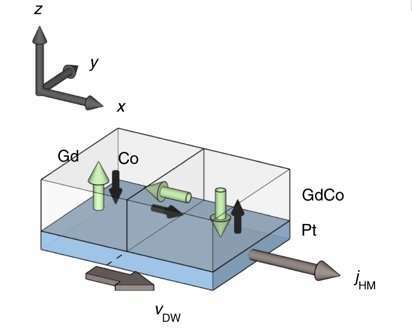 Spintronics devices make use of electron spin for a specific purpose. One possible application is in high-density storage devices. Such devices have been proposed using magnetic solitons (a type of quasiparticle) such as nanoscale domain walls in which a material has boundaries between areas where the magnetic moments point down on one side and up on the other, or magnetic skyrmions, which are particles related to baryons. In such a device, the solitons would serve as bits used to encode information—they would be moved using something called a racetrack, a device capable of moving domain walls or skyrmions along structures such as nanowires using current pulses that are spin-polarized. But to date, the development of a such a commercial device has been stymied by a problem—the bits are actually too big, which makes it difficult to move them fast enough to make the whole idea worthwhile. In this new effort, the research team suggests using ferrimagnets instead of using ferromagnets in such devices. Ferromagnets are traditional magnets, materials that have properties that resemble iron. Ferrimagnets, on the other hand, are materials that have two types of ions with magnetic moments that are not equal, and which are also polarized in opposite directions. The researchers suggest using them could allow for the creation of smaller bits because they allow faster domain wall dynamics to occur—this is because there would be no change in net angular momentum required to reorient magnetic moments. They claim making the switch would allow for an order of magnitude improvement in both size and speed without resorting to cryogenics. This could result in the creation of new consumer products in a relatively short period of time. Still 2 flux transversal's for magnetic particle / molecule to reorient giving a bit change boundary and 2D data storage. 3D (dimension) is the future, i.e. holographic.